Almost two years ago, a San Luis Obispo city employee ordered others to dump chemicals and paints at a city facility. The state’s Department of Toxic Substance Control began an investigation and told witnesses that criminal cases would be started in about six months. As the two-year anniversary of the dumping approaches, the department has not taken any enforcement action and the case remains open, DTSC staff counsel Jay Cross said. The department’s own records suggest that it is highly unlikely that any enforcement action will ever happen. The department is charged with protecting Californians from exposure to toxic substances. But even though the agency’s criminal investigators open dozens of cases each year, they rarely follow through with prosecution and often fail to collect fines. Since Jan. 1, 2012, the agency has opened 239 investigations, though it only followed through with an enforcement request in one case, according to DTSC spreadsheets. 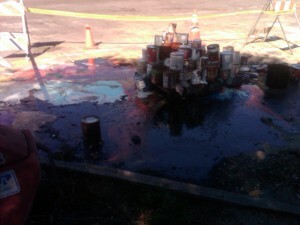 In January, 2012, a city employee told several subordinates to pour out cans of acetone (solvents), varnish, epoxy, creosote, enamel paint and latex paint. The chemicals were dumped on an asphalt parking lot that abuts a grassy area and is within 250 feet of a waterway, CalCoastNews reported. Following the CalCoastNews article, investigators from the Department of Toxic Substance Control arrived in the city and mounted an investigation. Investigators assured witnesses who agreed to provide information about the deliberate dumping that the DTSC planned to file criminal charges. The 25-year-old agency is responsible for enforcement, regulation, and pollution prevention. If investigators discover illegal disposal of waste, their job is to seek criminal prosecution from city attorneys, county district attorneys, the California Attorney General or the U.S. Attorney, according to the DTSC. But over the past decade, the number of department criminal investigations has dropped by half while the number of cases sent for enforcement is almost non-existent, according to DTSC spreadsheets. In 2005, department investigators asked prosecutors to bring charges against polluters involved in 45 investigations. Those numbers have fallen to two requests for enforcement in 2011, one in 2012 and none in 2013, according to department spreadsheets. The department has a budget of $189 million for 2013 and has 866 employees, its files show. In addition to a failure to initiate criminal enforcement, in May the agency admitted it had no system in place to track unpaid fines and that it had failed to collect more than $185 million, DTSC spokesman Jim Marxen told NBC. Several legislators have asked the California Office of Oversight and Outcomes to investigate allegations the department’s failures to act are costing taxpayers and risking the public’s health. In January 2011, San Luis Obispo waste water collections supervisor Bud Nance told staffers to remove the contents of the hazardous waste storage shed at the city corporation yard on Prado Road and empty cans in the yard. After about two weeks, the chemical dump was reported to firefighter Kerry Boyle who inspected the site, according to city staff emails. San Luis Obispo city attorney Christine Dietrick supported Boyle’s conclusion and said that no wrong doing had occurred. In June 2012, the San Luis Obispo Fire Department filed a notice of violation against the city’s public works department for the illegal dumping of hazardous waste. However, no criminal prosecution has been brought or fines levied. The Sunday Los Angeles TImes had a front page story on this subject. It is too bad this story can’t be run as part two of that article. Karen’s article gives more details about the resistance and retaliation an investigative reporter experiences by exposing what is really happening with regard to disposal of toxic waste. A SLAPP suit has been filed against Calcoastnews by one of the individuals involved in this issue, public officials are either denying or covering up for the individuals involved, elected officials are backing them up and state watch dogs are incompetent from the top down. I hadn’t heard about a SLAPP suit related to this issue? Who filed it and what does it say? On a related note, I have observed that calcoastnews does occasionally make mistakes in reporting and engages in sensationalism at times as well. Is it a SLAPP suit if they did so here? What really burns me about things like this is the double standard for public employees and private businesses. 1) SLOPD is the city CUPA (certified Unified Program Agency) this means they manage any hazardous waste issues or incidents. 3) It would be Kerry Boyle’s job to respond to any Haz Waste incident in the city. So lets say a private business owner did the same thing that happened here. They ordered there employees to dump a bunch of paint and solvents and other nasty stuff on the pavement on there property, close to a stream. Let’s say someone reported it. The SLOPD would show up in force and lock down the whole area. Mr. Bolye would show up, look over the situation and almost certainly call out very expensive Hazmat contractors to clean the whole thing up. Mr. Bolye as the CUPA, would report to DTSC. Might take several days to complete the cleanup. Bottom line, when it is all said and done, the business owner would be charged all the cost associated with the cleanup and fined heavily. They would also have a criminal prosecution hanging over their head for years, This would probably bankrupt the business and the owner. Starkly different treatment, totally not fair! Anything that has to government anymore is certainly not fair. Government is so corrupt, it is like a disease that will never be cured and only keeps getting worst. It doesn’t have to be that way but voters seem to be willing to pass on more power to the government when it does things that they like — conveniently forgetting that those powers can be used to do things they don’t like later. Government is not the only source of societal greed and evil. Economic power can have the same effects. (See banks, insurance companies, utilities, energy companies, defense industry, etc.) Government is even necessary to balance these other sources but must be kept in check and watched very carefully for corruption and collusion with those from whom it ostensibly protects us. We don’t do a good enough job of that. I am starting to believe most government jobs are actually a form of welfare for people who pretend to work. Maybe the failure of the 866 employees of the CA Department of Toxin Substance Control to do their jobs is why the American Lung Association, in a 2013 report, found that the most persistently polluted regions in the country are in California. THE TOP NINE MOST POLLUTED AREAS IN AMERICA ARE IN CALIFORNIA. With the exception of the LA metro area, all the others listed are in the top 7 are located in the Central Valley. While there is certainly a fair contribution on the part of people to those levels of pollution (vehicle exhaust, agricultural spraying and plowing), I doubt that they contribute enough to result in “Top 10 Pollution” status by themselves. What the Central Valley has going against it is that it naturally traps the pollution generated there (and from the Bay area as well.) The failure of Mother Nature to consistently move the pollutants out of the valley and into the upper atmosphere is why the Valley is as bad as it is. I don’t think any state department or bureaucracy can do much about that and major efforts to combat pollution sources will have significant economic consequences. While keeping an eye on efficiency of state bureaucracies is necessary to keep them functioning properly, expectations should be realistic. I would imagine that, unlike the DTSC, the American Lung association would be concerned primarily with air quality, and in the worst the areas listed, that PM-10 from diesel exhaust, plus airborne dust from plowing fields just “might” be significant factors? • The corrupt supervisor who commanded his subordinates to break the law, harm the environment, and risk public health because he was mad at the city. • The corrupt fire department inspector who, incredibly, concluded the city doesn’t have to follow the law that normal people have to follow when dealing with toxics. • The corrupt city attorney who backed up the corrupt fire inspector. • The corrupt City Council that tolerates this “business as usual” and does nothing to discipline its wayward staff. While it’s outrageous that the state toxics agency does nothing, what about our own local government that treats the people and the environment in such a high-handed corrupt way? That’s within our control, yet what do we do other than write stuff here? How about some action, folks! I believe that DTSC has reviewed this incident and determined it to be “minor” in the whole scheme of things. They have evaluated the impacts to to humans and the environment, and made a determination. This is not to say this incident isn’t important, it is. However, hundreds of these incidents are occurring almost daily, most, much worse, and DTSC has to respond and prioritize each and every one. Remember, their budget has been affected like every other state agency. I doubt, given the nature of this incident, that there will be any criminal charges brought forth, but some sort of enforcement action is sure to follow. Nice to have an apologist for the DTSC on board. What’s your civil service level? Why can’t local law enforcement, ie the DA, prosecute this? A law is a law and this sounds like a possible felony. Let’s remember these actions as the city’s compensation committee comes forward with reasons for pay raise for all city employees.